Pramitha Love Cooking!!!!! 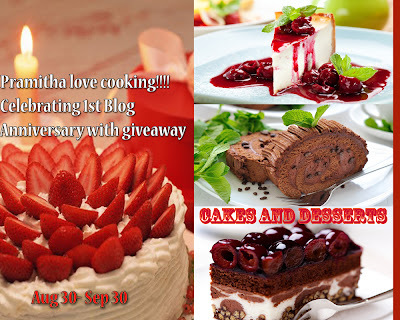 : Celebrating My 1st blog Anniversary with Giveaway!!!! I am glad to announce my first giveaway in my blog on this special day.To know more about my 1st blog Anniversary recipe please click here!!! The event on my blog starts today 30th Aug, 2013 and ends on 30th Sep, 2013.I am very excited that Onam is celebrated during this month.Onam is the most popular and important festival in Kerala in India.So according to me, celebration is not complete without desserts.So the theme of my event is "CAKES & DESSERTS"
Now comes the most exciting part of the event...Giveaway!!! There will be two giveaways.Giveaways are sponsored by Ethnique art of boutique and Nityasya. First prize sponsored by Ethnique art of boutique and Second prize sponsored by Nityasya.Both of them are giving beautiful churidar materials. Winner's are selected on the basis of best recipe and presentation. 1. The event runs through the month of Aug 30 - Sep 30. 2.Use linky tools to enter your recipes at the end of post or mail me on pramitha.prami@gmail.com. 3.Only vegetarian recipes are allowed (eggs allowed). 4.Please submit only Two recipes,including one archieved entry. 5.Both recipes should linked back to this Pramitha love cooking celebrating 1st blog anniversary page. 6.Usage of logo is compulsory; it's recommended that you use it as it helps spread the world. 7.You have to Like my page , Pramitha love cooking through facebook & GFC. 9. You need to post about the event on your facebook page and tag my facebook page by typing "@Pramitha love cooking " in the post. 10. In case you have a problem using linky tool you can send the details to pramitha.prami@gmail.com using subject line of Pramitha love cooking celebrating 1st blog anniversary. 11.For the Non-Blogger: you can send the recipes with details and pictures to pramitha.prami@gmail.com in the following format using subject line of Pramitha love cooking celebrating 1st blog anniversary. 12.Non-Blogger's should follow the above rules 7 & 8. 13.Once you completed all the things, please mention in the comments section that you have done these with your recipe names, facecbook id,and GFC. The giveaway is open to all .I will post the round up within ten days after the event gets over. Happy Cooking! Looking forward to all your entries. Congrats Pramitha, happy birthday to ur blog baby..Lovely event as well. CONGRATS ON UR MILESTONE DEAR!! HAPPY HOSTING! Nice event will link in soon.Following you already via GFC with name sangu and your facebook page with name Sangeetha Shreenidhi. Happy birthday to ur blog.following through GFC,liked all pages.Linked my first one. congratz on your anniversary dear :) thats an lovely theme, i will link my recipe too :) Am following you , also an fb fan. hi pramitha! already liked your fb page , liked the same of sponsors too. updated my post baklava with logo and link. I liked all 3 FB pages and linked 2 entries. Linked my recipe to your lovely event. Congrats on your baby blogs first year anniversary .. Liked my recipe : eggless banana cake with cream cheese frosting . Liked urs fb and sponsors fb pages . Posted and tagged u in fb. Hi Pramitha ,Congratulation dear for your blogs 1st anniversary.Linked Quick Nariyal(Coconut)Ladoo to the event.Following you on FB and GFC .Posted abt u on my FB page .Please chk https://www.facebook.com/IndianRecipiesByPrerana. Congrats on ur blog anniversary.Love the perfectly made chocolate cake.So nice of you to encourage bloggers with such events. I have liked ur facebook page and both the sponsors. Also in GFC.Shared the link on my FB. Will try to submit one more soon.Do visit my space too. Just added my second entry too. Hi pramitha,Congrats on your blog anniversary.Have liked the FB pages and sent my entries to ur mail id as i am non blogger.Happy hosting! Sorry for the late since i was on NY tour...Herewith I followed you on GFC and google plus too.Already liked FB page of urs and sponsor pages too. My entry is 2 Tier Cake...Have linked cake entry to it with your logo name and link name in my blog.Do visit my blog and give your comments dear.Will link one more sweet entry...Awaiting to hear it from u.Hope I am qualified? I posted FB abt ur page and tagged yours too..Awaiting to hear whether iam qualified?